This is an authentic Greek Salad Recipe, a delicious and healthy salad recipe, great for lunch, dinner, summer, winter or any time. I love Greek salad. There is just something about the combination of lettuce with that yummy dressing, the slightly salty Feta cheese, the black Kalamata olives, the nippy onions and the coolness of the tomato and cucumber. It is a mixture that really can’t be beat. Combine the lettuce, tomatoes, cucumber, and onion in a large bowl. Pour enough olive oil over the salad to just coat it. Add the lemon juice and oregano. Season well with salt and pepper and toss the salad. Adjust the seasoning to suit your taste and toss again. Add the crumbled feta cheese and the olives to the top of the salad before serving. Serves 4 to 6 as a side salad, 2 or 3 as a lunch portion salad. Adjust the lemon juice to taste. I would juice the lemon separate from the salad rather than right into it to prevent you from making overly lemony. You may need a bit less than the juice from a whole lemon or a bit more, depending on your taste and the amount of other ingredients you are using. Red onion adds a nice bit of color to the salad. They are also nice and mild. The traditional olive that the Greeks use in this salad is Kalamata olives. If you can’t get them or prefer another kind, simply substitute your favorite. The Kalamata olives really work well in this recipe though. Add a grilled, sliced chicken breast to the salad to make it a complete meal. The Greeks add lemon juice and olive oil to just about everything and it sure does work here. It is an amazing taste combination. Add a bit of sliced grilled chicken and this salad becomes a delicious meal in a bowl. The Greeks really know their salad! 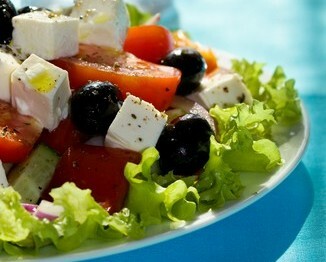 Greek salad is one of our healthy diabetic recipes. It is a wonderful addition to any low carb diet. You will find our Caesar salad recipe here. 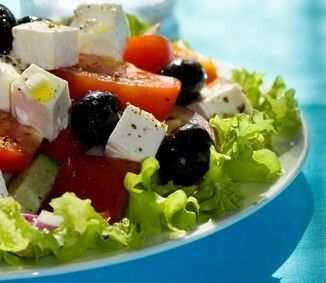 This delectable Greek salad recipe is just one of our amazing salad recipes. 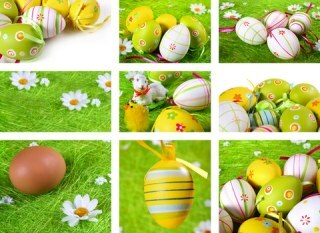 Find them all here.